Fresh off the terrific finale to Rick and Morty's great third season, now seems like the ideal time to look in on Funko's action figure offering, covering five characters (and a sixth as a Build-A-Figure) as part of their Funko Legacy line. First up, the titular Rick himself, Rick Sanchez! "I'm sorry, Morty. It's a bummer. In reality, you're as dumb as they come. But I needed those seeds real bad and I had to give 'em up just to get your parents off my back. So now we're gonna have to go get more. And then we're gonna go on even more adventures after that, Morty. And you're gonna keep your mouth shut about 'em, Morty. Because the world is full of idiots that don't understand what's important. And they'll tear us apart, Morty. But if you stick with me, I'm gonna accomplish great things, Morty. And you're gonna be a part of 'em. And together we're gonna run around, Morty, we're gonna do all kinds of wonderful things, Morty. Just you and me, Morty. The outside world is our enemy, Morty. We're the only friends we've got, Morty. It's just Rick and Morty. Rrrick and Morty and their adventures, Morty. Rick and Morty, forever and forever, a hundred years Rick and Morty, s... things. Me and Rick and Morty runnin' around and Rick and Morty time. Aaall day long forever. All, a hundred days Rick and Morty forever a hundred times. Over and over Rick and Morty adventures.com www.Rick and Morty.com www.Rick and Morty adventures all hundred years. Every minute Rick and Morty.com www.hundred times Rick and Morty.com!" Funko Legacy sticks to the 5" scale, and the 5½" tall Rick fits that perfectly. 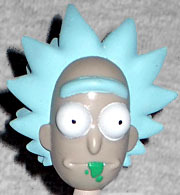 Rick is well-sculpted here, capturing his specific deranged, drunken look from the TV series. This is a look we see often, albeit probably not the angry-frown most viewers associate the character with since the second season raised the bar. 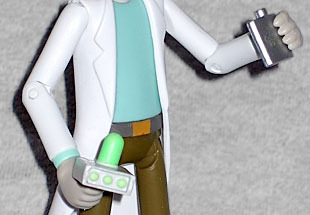 Funko have done a great job with the basic costume and look of the character; Rick's crazed spiked hair and the green drool from his mouth is excellent, as is his simple-but-terrific labcoat and teal top. One cannot discount the work that goes into translating a 2D cartoon character into 3D, and a great job has been done here. Alas, paint is not quite up to scratch; Rick features a globby paint job that runs, specifically notable around the eyes and hair. This is slightly more acceptable for the pricepoint; Funko Legacy toys run half the cost of a NECA figure, so one probably shouldn't expect this to approach NECA quality, but if you can, do inspect the toy in the package at the store. Similarly, the articulation is not quite the best either; Rick has a balljointed neck, rotating hinge shoulders and legs, then pegs at the knees and elbows, and finally peg joints at the wrists and shoes. The real ommission here is a swivel at the top of the shoulders and legs, which limits the amount of posing you can get out of his arms, and can make it difficult to stand. Again, these are not NECA figures, but the fault with the articulation doesn't come down to the cost as much as it comes down to the design; these are simply not great joints, and do not compliment the figure. A few smart changes and this could be a really great figure at the same cost. Rick features two suitable accessories; the first, his iconic portal gun, which looks terrific and he weilds with gusto, and his flask. This is very small and his hands require a bit of work to hold it tight, and suffers from the same sloppy paint as the main figure. 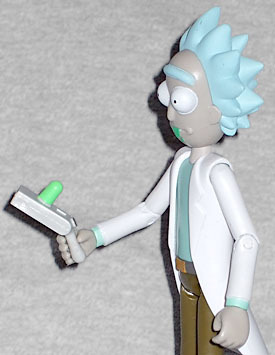 Finally, Rick features a piece from the Snowball Build-a-Figure, which raises the value a little. It's the right arm. Is Rick a great figure? No, but he's very good, and at this price point an excellent buy for fans of Rick and Morty. And who isn't a fan of Rick and Morty at this point? Heathens? Idiots? You tell us!